The Matrix-Rhythm Therapy is a 21st century technology which is being successfully applied in more than 2000 medical facilities and rehabilitation centers worldwide. This method was developed at the Institute of Traumatology of Friedrich Alexander University in Erlangen-Nuremberg, Germany, after 10 years of research conducted by a team of scientists led by Dr. Ulrich Randol. At cellular level, the human body is in a constant movement even when the person is at rest. The rhythmic activity of a healthy cell is expressed by vibrations with a frequency between 8 and 10 Hz. Diseases and traumas weaken these vibrations and as a result of that the transportation of nutrients and oxygen to the cell deteriorates, which on its part causes disturbances in both muscle and nerve tissues and slows down the transportation and removal of waste products from the entire body. The Matrix-Rhythm Therapy normalizes the vibrations to the level of their natural rhythm, restores the elasticity of tissues and regulates the organism’s functions. How exactly does the Matrix-Rhythm Therapy work? 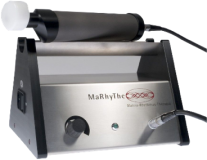 MaRhyThe is a device which uses a combined mechanical and magnetic resonator, creating a magnetic field, which on its part induces a specific harmonic stimulating wave that is mechanically transmitted to the tissue. Under the traditional methods of physical medicine, skin, muscles, connective tissue, lymph nodes and reflex zones are externally and superficially stimulated by rubbing, smoothing and the activation of certain nerve points. MaRhyThe achieves deep impact at cellular level and recovers the healthy micro-rhythm in the intercellular matrix and the metabolism of tissue-forming cells. Which are the diseases MaRhyThe is recommended for? What is achieved with MaRhyThe? Regulates blood sugar and blood pressure. The therapy is applied locally and only to certain body parts – head, face, neck, legs, backbone, chest, abdomen, and joints – but it could also be applied in an overall manner to the entire body. We recommend that therapy be used as prophylaxis, as well as an effective anti-cellulite treatment. Lucky Bansko Aparthotel Spa & Relax began offering the Matrix-Rhythm Therapy in 2018.